Billboard reports the band’s 15th studio release enters the Billboard 200 at No. 3 with opening week sales of 49,000 equivalent album units. “Dystopia” is the group’s highest US charting album since 1992’s “Countdown To Extinction” debuted and peaked at No. 2 upon its release. The follow-up to 2013’s “Super Collider” features new guitarist Kiko Loureiro and guest drummer Chris Adler from Lamb Of God following the fall 2014 departure of Chris Broderick and Shawn Drover. 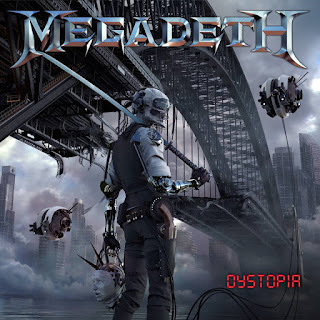 Megadeth will launch a North American tour in support of “Dystopia” with Suicidal Tendencies, Children Of Bodom and Havok on February 20 in Dallas, TX.